Ultimate Justice League Batmobile – AWESOMAGE! Batman has all of the coolest gadgets, but batarangs, grappling guns, bat bombs, tasers, and those cool gauntlets don’t really help much when you’re stuck sitting around in the Batcave because you don’t have a way to get around. Without a Batmobile, what would he do, take the Gotham City bus system? Don’t be left behind when there are villains afoot on the streets of Gotham! 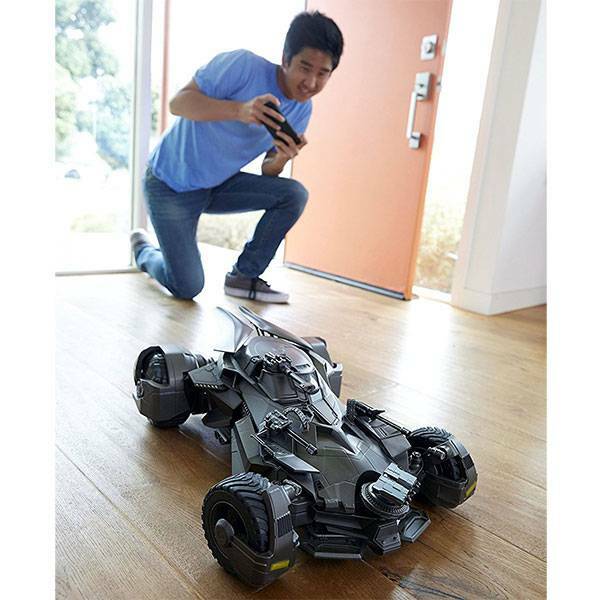 Bring them to justice with this deluxe remote-controlled Batmobile. It’s jam-packed with more features than the Dark Knight’s utility belt: a smartphone app controls the Batmobile and delivers a heads-up display from the driver’s POV camera in the cockpit, the figure’s arms turn the wheel as you navigate from your phone, the engine roars, smoke releases from the tail pipe, turrets move on the hood, and you can activate a special “jump mode” to elevate the vehicle for better aim. It comes with a detailed articulated 6-inch Batman figure to place in the cockpit – or you can use almost any other 6-inch scale figure, to give other characters a chance to take a spin in the ol’ Batmobile.